I think sympathy cards are hard to do, too, Lisa. This one is perfect and I know it will really touch the family to receive a handmade card. So thoughtful. This sympathy card is beautiful. I find I will make a few up when I don't need them, so I can just grab one when needed and it's seems to be an easier process. So sorry for your loss. I love the way yours turned out! That cork is wonderful! Sympathy cards are very tough. I like all the texture you have added to your card. It is not only something pretty to give comfort, it is something to feel and bring a little connection as well. I tend to do pastels and nature stamps on my sympathy cards. You really did a great job on this! I love all the textures and that cork is fabulous! Hi Lisa! Had to pop in to thank for leaving such a kind comment on my blog and for becoming a follower. Love your card too! Now I am following you! gorgeous!!! Love yellow and black together!!!! 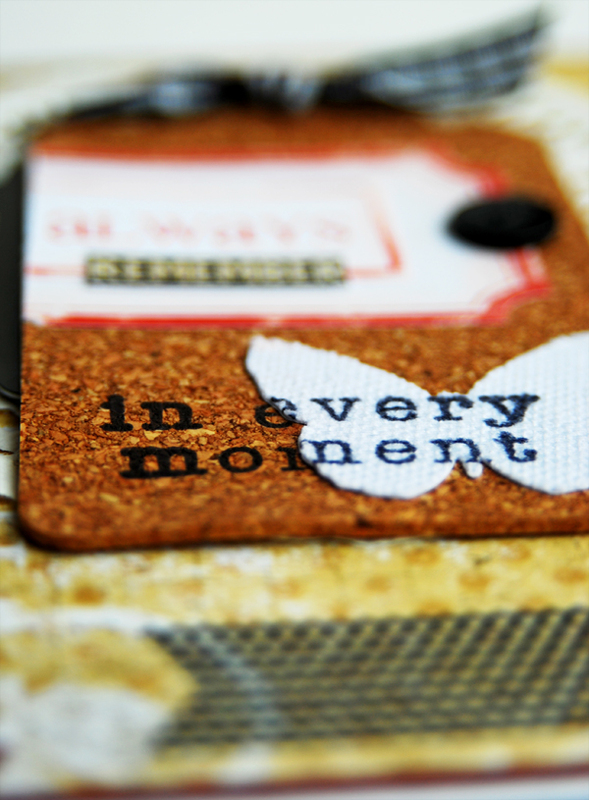 I love how you used the canvas butterfly and the cork, pretty card. Such a pretty card! 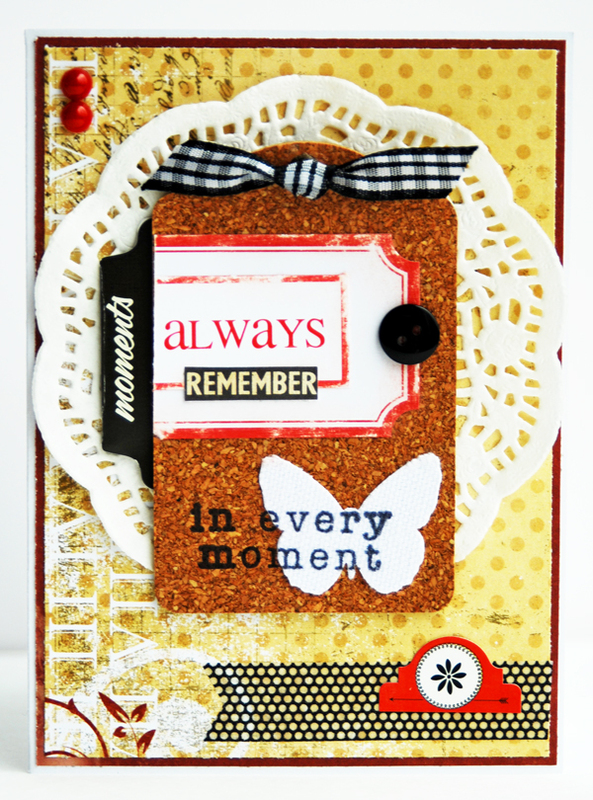 Love the color combo and the cork tag - and the stamping! Great card Lisa. I think you made a hard subject to send a card for perfect! Love the addition of the cork. Very nice sympathy card Lisa...I think it has a masculine feel to it. I know when i lost my Dad, i would have loved a card like this. He was a farmer and raised horses. We used to call him the horse whisperer as he could handle the stallions with no problem. The cork and the canvas butterfly made me think of him! We recently went through a hard time and received a lovely card with soft pink flowers and muted green stems going across it. I thought it was fabulous as it wasn't too frilly but totally thoughtful. I have a really hard time making these types of cards, I too usually end up just buying them. Thank you for the inspiration. those are the most difficult cards to make! you did a great job with this one. I think we all find it difficult to make these cards, but you did a great job on this. I agree Lisa. I think Sympathy cards are the hardest to create. But you did a beautiful job and I think the colors you chose for this one are so perfect! Beautiful card, and really appropriate for the occasion. I haven't made a sympathy card, but imagine it would be difficult. Beautiful card, Lisa!! Love the neutral colors you chose! I agree, these are difficult to make, but you did a fabulous job! Your card is perfect!!! I have made one sympathy card when my MIL lost her ex-husband. I was so unsure as to what to do. It came out okay. She loved it. Yours on the other hand is lovely! such a lovely and sweet sympathy card! I have only made one sympathy card...challenging. This is so beautiful...just love all the details you put into this! That is a lovely card, I love the colors. I always seem to stick with pastels or soft colors. 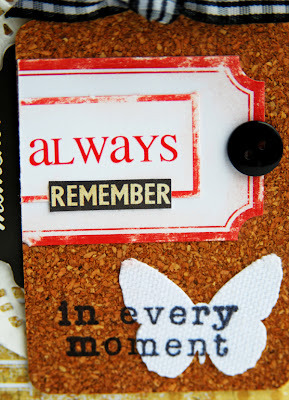 Thanks for linking up to Crafty Tuesday.